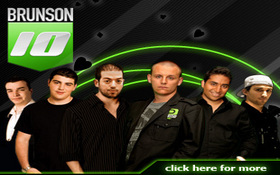 When the 2010 World Series of Poker began the Brunson 10 –Doyles Room’s collection of young online poker talent—had six members and was looking to fill its 7th spot on the roster that includes Steve “gboro780” Gross, Zachary “Crazy Zachary” Clark, Dani “Ansky” Stern, Amit “amak316” Makhija, Chris “Moorman1” Moorman and Alex “AJKHoosier1” Kamberis. Doyles Room decided on a competition during the 2010 WSOP between four pre-selected poker players –Dan “djk123” Kelly, David “DocSands” Sands, Faraz “The-Toilet” Jaka and Michael “Martine23” Martin—where the top point getter would be awarded with the coveted spot on the Brunson 10. Kelly was also able to wrap-up a spot on the Brunson 10 by winning a bracelet –which granted automatic inclusion to the Brunson 10—while Sands took the more conventional route staying atop the Brunson 10 Points leader-board throughout the WSOP, and was officially given the 8th spot on the Brunson 10 team. Jaka may also have played himself onto the Brunson 10 thanks to his recent live tournament success at the WSOP and other major tournaments around the globe. Martine had a rough 2010 WSOP –accruing zero Brunson 10 points—but is widely considered one of the top young Internet poker pros in the world. This entry was posted on Friday, July 23rd, 2010 at 11:31 am and is filed under Poker News. You can follow any responses to this entry through the RSS 2.0 feed. You can leave a response, or trackback from your own site.